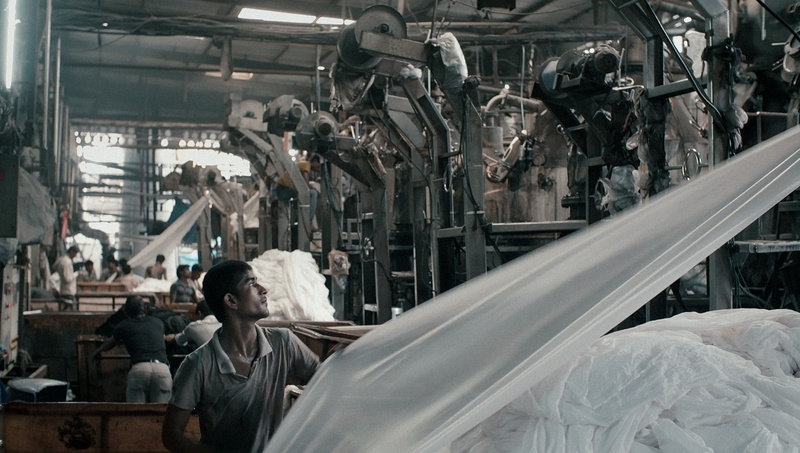 Director Rahul Jain presents an intimate, observantly portrayal of the rhythm of life and work in a gigantic textile factory in Gujarat, India. Moving through the corridors and bowels of the enormous and disorientating structure, the camera takes the viewer on a journey to a place of dehumanising physical labor and intense hardship, provoking cause for thought about persistent pre-industrial working conditions and the huge divide between first world and developing countries. Since the 1960s the area of Sachin in western India has undergone unprecedented, unregulated industrialisation, exemplified in its numerous textile factories. MACHINES portraits only one of these factories, while at the same time representing the thousands of labourers working, living and suffering in an environment they can’t escape without unity. With strong visual language, memorable images and carefully selected interviews of the workers themselves, Jain tells a story of inequality and oppression, humans and machines.